The current bailout package of financial assistance to Ukraine is not enough to stimulate economic growth in the country, so it will need more aid from the West, said Ukrainian Finance Minister Natalia Jaresko. “The package that we have is going to stabilize the financial banking system, but it’s not enough to seriously restart growth and promote growth,” said Jaresko after meeting US Treasury Secretary Jack Lew on Monday. "I'm looking for more support," she added. Ukraine will receive $17.5 billion from the IMF as part of the expanded bailout program until 2018. On March 13 the National Bank of Ukraine got $5 billion, the first tranche of financial aid from the IMF. 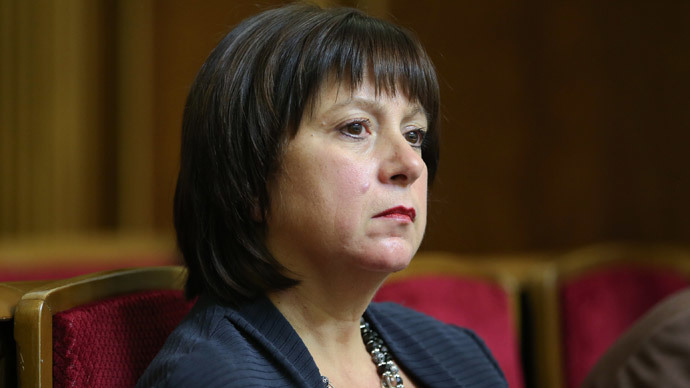 Jaresko said the government coalition must be united in overcoming the difficulties Ukraine is going through. During the meeting with senior US officials and lawmakers Jaresko said supporting Ukraine will bring other powers geopolitical benefits. US authorities, in turn, are ready to step up sanctions against Russia should it violate the Minsk agreements, said US Treasury Secretary Jack Lew during the meeting with the Ukrainian finance minister. He said the US will continue to work with the International Monetary Fund, the World Bank, the EU and other partners in order to provide support to Ukraine. However, nothing was said about providing direct financial assistance. In January the US Treasury agreed to provide Ukraine with $2 billion in loan guarantees. Ukraine will get $1 billion during the first half of 2015, provided Kiev continues to implement reforms, Lew said.